Alps Mountaineering Lynx 1 is the “everything you need” kind of tent. It has no extras and is bare bones; it does the job pure and simple. It’s one of the sturdiest models around, it keeps you protected. It’s cheap and it’s totally reliable. No other tent is as basically wonderful as Lynx 1 tent. Lightweight, durable and gets the job done. This is a one person style tent, and it fits one person comfortably. You can store your equipment inside the tent keeping your equipment dry and safe with very little to no hassle. The interior of the tent will be kept very cool due to the plethora of mesh available for good ventilation. This tent is also completely waterproof, only very strong storms cause wetness inside the tent. It’s basic but brilliant. One of the great thing about Lynx1 is that it has extra storage available in a vestibule that not many tents of this size and price have to offer. The fly and floor seams are specifically designed with a factory fitting so every time you unpack the tent it has that, “just come out of the bag” feel. It’s secure, steady and ultra reliable. With extra large #8 zippers on the door flap and vestibule flap are extremely durable and easy to grip in all types of weather conditions. The tent also features a post and grommet pole/tent connection with adjustable external guy out loops which are a brilliant feature that keep the tent stable in the wind. It allows slight give whilst being adjusted to the frame but not enough to cause a long lasting damaging affect. It truly is a brilliant design. Almost everything about Alps Lynx 1 is designed specifically to meet a campers needs, nothing has been left to the imagination, spared or skipped o when it comes to the Lynx 1. It has everything you need and covers all the bases. An interesting point is the aluminum frame which is light, strong and durable. This bare essential frame provides the most support for the least weight and the cheapest cost. 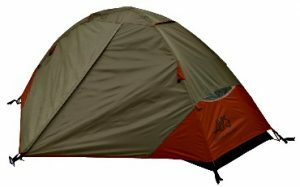 The outer frame of the Alps Lynx 1 tent comes in a dark grey outer shell and a copper/bronze finish along the bottom skirt. The first interior layer is a brighter grey which makes it easy to spot but also goes well with the other 2 colors. Without the outer-shell attached at all the black mesh fitting and grey inner shell combine with the orange frame to create a very rugged look. Lightweight, durable, good in all types of weather. Extra vestibule storage space which most tents of this size don’t offer. Won’t be knocked down easily in windy conditions. Very basic design, its bare bones. On the smaller side, you will not be able to fit two people comfortably in this model. Although lightweight it is still heavy compared to others on the market. If you are buying your first tent and it is going to be used by you along, buy Alps Mountaineering Lynx 1 person tent. It is basic, it has everything you would need. Read how to find best tents here. It works well, it is not flashy and most of all it gets the job done. This tent keeps you safe and dry and does not try to be something it isn’t, it’s simply rugged and we love it! Alps Mountaineering Lynx 1 person tent is one of the best 1 person tent available on the market.